Glacier Bag Program helps retail, grocery, and convenience stores increase sales of all wine, beer, and spirits. 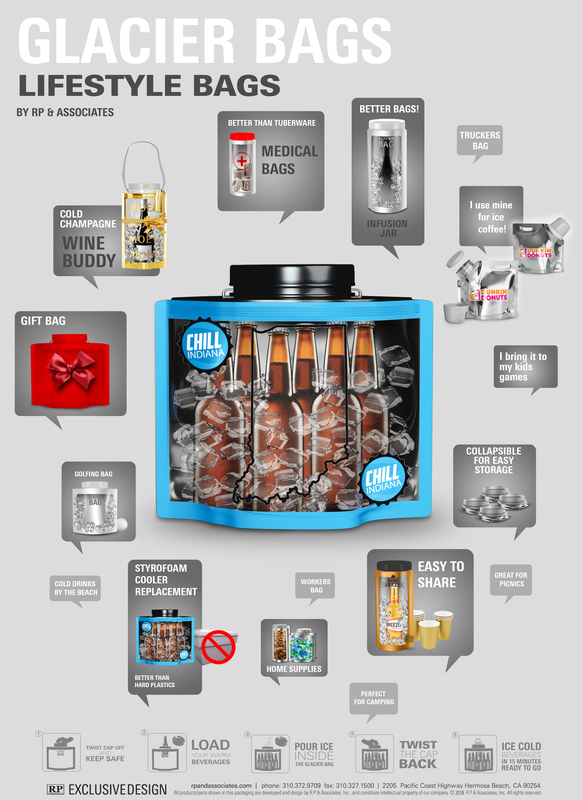 Increase sales in your most profitable category while providing customers a convenient way to chill and/or gift bottles, cans, or 6-packs. The Glacier Bag can also be used to sell ice, which creates a new profit center or increases profitability of existing ice sales – it’s a multifunctional lifestyle bag that has numerous functions and uses in all types of situations/applications. Reduces Cost & Saves Shelf Space - Cheaper alternative to a Styrofoam Cooler because it takes up less shelf and storage space. 15 to 25 Glacier Bags use the same amount of space as 1-2 traditional Coolers. Styrofoam Cooler Outlawed - Replacement for Styrofoam Coolers that are becoming outlawed across the country. Up-Sell & Combo Sales - Sell the Glacier Bag to Customers that are purchasing beverages, or create a combo with the Glacier Bag and slowing moving beverages to drive sales. Sell Ice - Allow customers to fill the Glacier Bag with ice at your fountain machine to eliminate your cost of ice. Wine Gift Bag - Sell the Glacier Bag with your wines to give your customers a functional giftbag that can also chill wine. Cold Beverages - Customers can purchase any beverage from your stores (2-Liter, Wine, Soda Cans, etc.) and it will be cold by the time they arrive to their destination. On the Go Convenience - Perfect for taking beverages to the beach, pool, BBQ, park, party, or anywhere else. Multi-Functional -Glacier Bag is a multi-functional lifestyle bag that your customers will use over and over again. Customers can use it as a traditional bag, dry bag, emergency bag, storage bag for foods/snacks, infusion jar, water bag, etc. Everyone knows a cold beverage is better. If you've ever purchased a beverage for immediate consumption at your destination (dinner, event, party, outdoor festival, tailgating, etc), you know how it important it is to purchase a cold bottle so it's not warm when it's time to drink. Even though we all want a cold drink, the bottles in most stores kept and sold at room temperature; if someone needs a beverage for immediate consumption, they are likely to wait or go somewhere else rather than drink a warm - less than satisfying - beverage. Glacier Bags allow you to sell ALL your bottles cold to help capture all sales and keep your customer coming back. Provide customers with the option to purchase a Glacier Bag with their bottles and/or 6-packs of bottles/cans. Customers pick their favorite beverage, place it the glacier bag, and add ice. Glacier Bag starts to chill your beverage instantly so it perfect for consumption when arriving at your destination; it's perfect for outdoor events and gifting bottles while quickly cooling them. Glacier Bag can also be used to sell ice by simply filling the bag with ice (without adding a beverage); this is a great way to start selling ice, or eliminate your ice cost by selling ice made on premise. If you do not have an ice machine, RP & Associates will provide a slim profile ice machine to each of your locations (at no cost) with the purchase of Glacier Bags.